Today, the U.S. District Court for the District of Columbia struck down the new Companionship Services/Overtime rule in a triumphant win for patients, staff, and providers of home health care. This ruling completely invalidates the rule, allowing for the current practices of payment for workers to remain in place indefinitely. This lawsuit which was strongly supported by HCAF and lead by the National Association of Home Care and Hospice was crucial to making sure patients would continue to be able to afford high-quality home care, as well as necessary for state budgets to be able to continue providing Medicaid home health. Your membership in associations like HCAF and NAHC is what allows us to advocate on your behalf on critical issues like this one, therefore we thank our members for their continued support and encourage all others to join today. Please read the press release from NAHC below for details on the case. It is unclear if the Department of Labor will file an appeal on this ruling, but for now, we are celebrating this fantastic success! The National Association for Home Care & Hospice (NAHC) and its members today celebrated the decision of the U.S. District Court for the District of Columbia invalidating a proposed new U. S. Department of Labor (DOL) overtime rule slated to take effect on January 1, 2015. “This decision is a huge victory for patients and their families who will be able to continue receiving home care services without interruption. The decision is a huge victory for caregivers who will continue to be protected instead of being forced to work only part time. The decision is likewise a huge victory for the agencies that serve patients and employ caregivers, and who will see continuity in a rule that has been in effect for 40 plus years and had recently been sustained by the U.S. Supreme Court. Finally, the decision is a huge victory for the states and the federal Medicaid program.” said Denise Schrader, chairman of the NAHC Board. This is the third victory in this lawsuit for home care interests within the last month. On December 22, the court ruled that patients are entitled to equal rights regardless of whether they or their families paid their home care bills or they were paid by the joint, federal-state health insurance program, known as Medicaid. On December 31, the court ruled for NAHC by agreeing to issue a Temporary Restraining Order (TRO) blocking the DOL from enforcing new rules related to “companionship” and “live-in” care. On January 9, the court, in considering a motion from NAHC attorneys for an injunction to block enforcement of residual parts of these rules through this date or a trial, stated that so much evidence was in the record there would be no need for a trial. The judge therefore agreed to give his decision on the case on or by January 14, when the TRO was set to expire. Today, the judge ruled for NAHC and home care interests, saying the proposed new DOL rules violated the law. “The victory in the case proves the power of unity,” said Halamandaris. “United, fighting on behalf of the aged, infirm, disabled, and dying, we cannot lose; divided we cannot win.” He also thanked Bill Dombi who helped lead the strategy in this case, the International Franchise Association and the Home Care Association of America which joined in the litigation and the law firm of Littler Mendelson which had been hired to bring the suit. HCAF will continue to keep members up to speed on all the latest developments as they occur. We will be keeping a log of the events, marked with dates at the link below for members. Click here for more details on the lawsuit and a log of the most recent events. P.S. With all of these changes happening very quickly, we strongly suggest members attendHCAF’s 2015 Winter Mini-Conference in Ft. Lauderdale, January 21-22. There is so much change occurring at a rapid pace, that HCAF feels it is imperative that we offer an educational event to supplement our Annual Conference and offer increased learning opportunities, on important topics such as this, more often throughout the year. Registration is still open, but space is filling fast! Click here for more details on HCAF’s 2015 Winter Mini-Conference and make sure to register today! HCAF will host our in-person Fall 2013 District Meetings next month, and home care professionals are encouraged to attend to learn about the PPS Final Rule, companionship exemption and connect with your local home care community. The dates and cities are confirmed and so are most of the locations. The remaining specific locations will be announced soon. Check our calendar for the latest updates. The summer temperature may be rising, but the price on the 2013 Benchmarking Study is at a season low! We are so excited about the impact that the 2013 Private Duty Benchmarking Study is having on the home care industry that we wanted to offer a special summer promotion to your members so everyone can experience the impact the study will have on your home care business. Order your copy at the lowest price of the season of $229 – that’s a savings of $70 (23%), compared to the original price of $299. And, when you purchase your study today you will receive our “Taking Action” 4-part webinar series with Home Care Pulse founder/CEO Aaron Marcum for free….a $299 value! In this 4-part series, Aaron walks through some of the key findings of this year’s study and how to apply the information to your home care business. The deadline to participate in the 2013 Private Duty Benchmarking Study is this Friday, March 8. If you are a home care business owner, please sure to be participate in home care’s largest national study by Friday by clicking here. Hundreds have already taken advantage of this year’s study to improve and grow their home care businesses. Modify the Health Insurance Portability and Accountability Act (HIPAA) Privacy, Security and Enforcement Rules to implement statutory amendments under the Health Information Technology Economic and Clinical Health Act (HITECH Act) to strengthen the privacy and security protection for individuals’ health information. 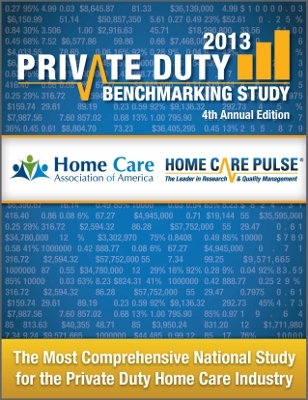 The Home Care Association of Florida is proud to be a participatingorganization in the 2013 Private Duty Benchmarking Study, in partnership with Home Care Pulse and the Home Care Association of America. As a reminder, please take the survey to get Your 2013 Instant Personalized Report and help us reach 20% participation, so that we can provide you with benchmarks to compare your agency to the rest of our state. Late last month, the U.S. Department of Labor (DOL) sent a memo to members of Congress stating that the rule that would extend federal minimum wage and overtime protections to in-home health care workers, is pending in the Office of Management and Budget (OMB). Participate in the 2013 Private Duty Benchmarking Study! This month, HCAF is proud to be a participating organization for the 4th Annual Private Duty Benchmarking Study, in partnership with Home Care Pulse and the Home Care Association of America (HCAOA). Posted in Private Duty | Comments Off on Participate in the 2013 Private Duty Benchmarking Study!